Seules 14 % des PME britanniques considèrent que le TTIP (Partenariat transatlantique de commerce et d’investissement) et les autres accords en préparation seront bénéfiques pour leur entreprise. Pour l’Institut Veblen, les résultats de la nouvelle enquête sur la perception des négociations commerciales par les PME britanniques (1), qui s’ajoutent à des préoccupations exprimées par les PME belges et allemandes, doivent inviter la Commission européenne à corriger le tir. Au Royaume Uni, les PME représentent près de 99,9 % des entreprises et pèsent 60 % des emplois et 47 % du chiffre d’affaires du secteur privé. Interrogées sur leur perception des négociations transatlantiques en cours ainsi que sur les autres accords en préparation, elles expriment, à l’instar des PME allemandes (2) ou belges (3), des préoccupations sur la prise en compte de leurs attentes dans les négociations. Plus de la moitié des personnes interrogées considèrent que les intérêts des PME ne sont pas suffisamment pris en compte lors de l’adoption d’accords de commerce qui ont un effet significatif sur elles. Cette étude, après celle menée par la BVMW, confirme le déficit d’information et l’écart important entre les déclarations de la Commission européenne qui annonce que les PME seront les premières bénéficiaires des futurs accords de commerce et les perceptions des PME dans différents pays européens. Par ailleurs, l’étude préliminaire d’impact sur le développement durable, publiée le 13 mai dernier, a aussi pointé la difficulté de traiter dans le TTIP les défis pratiques des PME à l’export et spécifié que les principaux gains ne se situeront pas dans les secteurs dans lesquels la plupart des PME sont actives. Ces constats invitent à mieux informer et prendre en compte les attentes des PME dans les négociations commerciales et les conséquences possibles pour celles dont les activités visent principalement le marché européen, national ou local. Le Comité économique et social européen et le Conseil économique, social et environnemental français demandent la conduite d’une étude d’impact par pays et par secteur depuis plusieurs mois. Si la Commission européenne refuse de le faire, rien n’empêche le gouvernement français de s’y atteler. TTIP / TAFTA : the key to freer trade, or corporate greed? Publié : 07/01/2016 | Auteur : Non merci | Classé dans : "-- ISDS - RDIE - ICS Arbitrage Investisseur-État, *.Accord UE/USA / TAFTA / TTIP, -- Santé - Retraites, Accord ALENA - (USA-Canada-Mexique), vu d'Angleterre | Commentaires fermés sur TTIP / TAFTA : the key to freer trade, or corporate greed? Cheap American olive oil could, in a few years’ time, be sitting on supermarket shelves next to the Tuscan single estate varieties loved by British foodies. At present a prohibitive tariff on US imports effectively prices them out of contention. But a groundbreaking trade deal could lower the $1,680-a-tonne tariff on US olive oil to match the $34 a tonne the US charges on imports from the EU. Or the tariffs could disappear altogether. Either way, Greek, Spanish and Italian olive farmers must fear the Transatlantic Trade and Investment Partnership (TTIP), a deal that aims to create a level playing field between them and massive US agri-businesses. Trade deals were once seen as a panacea for global poverty. In the 1990s, the World Trade Organisation was formed to harmonise cross-border regulations on everything from cars to pharmaceuticals and cut tariffs in order to promote the free flow of goods and services around the world. There was always a fear that, far from being a winning formula for all, lower tariffs would favour the rich and powerful and crucify small producers, who would struggle to compete in an unprotected environment. The effects of the North American Free Trade Agreement (Nafta), signed by the US, Mexico and Canada in 1993, appeared to justify that fear: it became in later years a cause celebre for anti-poverty campaigners, angered by the plight of Mexican workers. Not only were they subjected to low wages and poor working conditions by newly relocated US corporations – and, as consumers, to the relentless marketing power of Walmart, Coca Cola and the rest – but the major fringe benefit of cutting corruption remained illusory. This year the US hopes to sign what many believe will be Nafta’s direct successor – TTIP. Should it get the green light from Congress and the EU commission, the agreement will be a bilateral treaty between Europe and the US, and, just like Nafta before it, outside the ambit of a gridlocked WTO. Supporters say it will be an improvement on its predecessor because the main proponents are a liberal US president and a European commission that considers itself concerned with workers and consumers. Why, the commission asks, would 28 relatively affluent member states with concerns about high unemployment, stagnant wages, welfare provision and climate change agree to a charter that undermines workers’ rights, attacks public services or reduces environmental regulations? TTIP is also billed as an agreement between equals that allows both sides to promote trade: it is claimed that the UK’s national income could be raised by £4bn-£10bn annually, or up to £100bn over 10 years. That amounts to a 0.3 percentage point boost to GDP, which would have pushed this year’s expected 2.4% growth to 2.7%. But it strikes fear into the hearts of many, who believe it to be a Trojan horse for rapacious corporations. These corporations, hellbent on driving down costs to enhance shareholder value, spell the end for Europe’s cosy welfare states and their ability to shield fledgling or, in the case of steel and coal, declining industries from the harsh realities of open competition. TTIP has been compared to the 1846 Corn Law abolition, which either swept away protectionist tariffs that impoverished millions of workers, or protected a vital source of food and led Karl Marx to ask: “What is free trade under the present condition of society?” His answer was: “It is the freedom which capital has to crush the worker.” Is that the case with TTIP? Here are five key factors to consider. From the moment TTIP became part of President Barack Obama’s growth strategy, critics have feared that he little realised the expansionary intentions of US healthcare companies or was too distracted to care. The concern relates to the prospect of EU countries, under pressure from rising healthcare costs, handing over major parts of healthcare provision to the private sector. Once services are in private hands, say critics, TTIP rules will prevent them being taken back into state control. Since these fears were voiced, trade negotiators have excluded provisions that would have allowed firms to sue governments for the loss of health and public services contracts once they expired. This allows the UK’s rail franchise system and the contracting-out of health services to continue under time-limited contracts. But the US private health industry, which is the largest in the world, views a Europe struggling with the needs of an ageing baby-boomer generation as ripe for the picking. For this reason alone, contracting out the distribution of drugs, the supply of medical devices and the provision of vital services could prove irresistible. A little known facet of every trade deal is a separate form of arbitration for the businesses covered by the agreement, allowing them to avoid the civil courts. As such, the investor-state dispute resolution (ISDS) gives foreign investors the power to sue a government for introducing legislation that harms their investment. Famously, it was used by big tobacco to sue the Australian government when it introduced plain cigarette packaging. Before and after the scandal, other governments have come under legal challenge from corporations concerned that public policymaking is denying them revenues. In spring 2014, UN official and human rights lawyer Alfred de Zayas called for a moratorium on TTIP negotiations until ISDS was excluded. He warned that the secret court tribunals held to settle trade disputes were undemocratic. Their reliance on a small group of specialist lawyers also meant that arbitrators sitting in judgment were the ones who at other times represented corporate clients. De Zayas feared that smaller states would find themselves in the same position as many governments in trade disputes, suffering huge legal bills and long delays to public policy reforms. He was joined in his mission by NGOs and, most importantly, by MEPs in Strasbourg. As a first concession, the US side agreed to prohibit “brass-plate” firms – those that exist only by name in a county, without any employees or activity – from suing a government. This aimed to prevent a repeat of the Australia incident when the Ukrainian arm of tobacco firm Philip Morris, effectively a brass-plate entity, spearheaded the attack on plain packaging. Many EU politicians said this concession was too easy to circumvent, leaving corporations in a powerful position. So Europe’s chief negotiator, Swedish commissioner Cecilia Malmström, hatched a scheme for an international court of arbitration – an open public forum instead of the private court system. Even her critics said it was a bold move, and unlikely to be accepted by the Americans. The two sides have yet to formally discuss either proposal: under deals between the US and Japan and the EU and Canada the issue was barely mentioned, but it is now expected to be among the most contentious. So how would Froman apply this to the fact that American cars will still be left-hand drive, restricting their use on British roads? He argues that the cost of imported cars, research and development and testing can still benefit from the harmonisation of regulations on either side of the Atlantic. Yet there is nothing US food regulators would like less than to accept processed foods tested by EU officials who failed to spot the horsemeat scandal. And EU regulators are duty bound to reject GM foods, after sustained protests by Europe’s consumers in direct conflict with US farmers. Washington claims it will accept the science when it applies to regulations, which supports GM foods being accepted by the EU as part of TTIP, just as it is part of the WTO agreement. Dispensing with tariffs seems like a straightforward process compared with tackling complex regulations. Under TTIP, tariffs on goods and services should disappear, though it is expected that some will only be reduced, and others may take years to go the way of history. Under the Trans Pacific Partnership (TPP) recently agreed, but not yet implemented, between the US, Japan, Australia, Vietnam and other East Asian countries, all goods, from pork to cars, are covered. A good example of how long it can take for tariffs to come down is found in the case of the 2.5% rate slapped on Japanese car imports to the US: this will start to be incrementally lowered 15 years after the agreement takes effect, halved in 20 years and eliminated in 25 years. In return, Japan will, among other things, lower its tariff on imported beef from 38.5% to 9% over 16 years. A similar programme could be possible under TTIP, with olive oil tariffs lowered over 25 years. 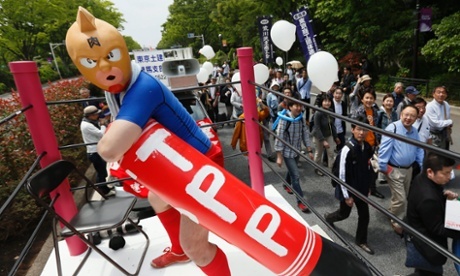 Japanese trade unions supported the TPP deal, and unions in Europe are expected to follow suit with TTIP. They accept that labour protection rules lie outside the scope of a deal, and that their governments can therefore continue to implement minimum wage legislation and other supportive measures without being sanctioned. But unions, where they exist, tend to represent workers in successful industries, which naturally welcome access to wider markets. Workers in weaker areas of the economy could find their jobs coming under pressure from harmonised regulations, lower tariffs, or even just exposure to a US rival with a work ethic that denies most employees more than two weeks’ holiday a year. TTIP is important to the UK government because the US is our biggest market for goods and services outside the EU. It’s seen as especially important for small and medium-sized businesses, which appreciate the lack of language barrier. Britain also has a trade surplus with the US: we export more than we import, which helps counterbalance the country’s huge trade deficit. Such is the momentum behind the talks that a deal could be agreed by the end of the year, and go before Congress and EU parliaments in 2017. Both sides claim to be making good progress. But the dispute over ISDS and protests from farmers could yet quash Obama’s hopes for US olive oil sales. Construire un mouvement d’opposition aux accords de libre-échange n’est pas toujours facile en Grande-Bretagne. En tant que petite nation insulaire, le commerce a dominé notre histoire. Pendant longtemps, la Grande-Bretagne a été en mesure de faire en sorte que le commerce « libre » serve ses propres intérêts, à travers l’exploitation massive de ses colonies durant l’époque impériale. Du fait de la prospérité héritée de cette exploitation de plusieurs siècles, il y a moins de résistance instinctive au libre-échange au Royaume Uni que dans d’autres pays européens. Le Partenariat transatlantique de commerce et d’investissement (connu sous son acronyme anglais TTIP, ou Tafta, ndlr) change la donne. Aujourd’hui, une partie croissante de la population britannique est consciente que ces négociations secrètes entre l’Union Européenne (UE) et les États-Unis vont au-delà du champ et de l’ambition des accords de libre-échange traditionnels. Et nous sommes de plus en nombreux aussi à nous rendre compte que le TTIP, si l’on permettait qu’il soit ratifié, représenterait le plus considérable transfert de pouvoir au bénéfice du capital transnational de notre époque. Auparavant, les accords de libre-échange cherchaient principalement à réduire les tarifs de douane pour encourager le commerce de marchandises entre pays. A contrario, le TTIP cherche explicitement à aller au-delà des frontières pour s’attaquer à l’espace politique souverain des États, en visant les barrières « non douanières » qui empêchent les entreprises multinationales d’engranger autant de profits qu’elles le pourraient à travers le commerce et l’investissement. Les responsables des États-Unis et de l’UE ont confirmé à maintes reprises que leur priorité, à travers le TTIP, est de supprimer ces « barrières » que sont les lois et les régulations. Un exercice censé libérer des millions de dollars de profits pour leurs amis dans les milieux économiques. En réalité, ces « barrières » incluent certaines des normes sociales et environnementales qui nous sont les plus chères. Parmi les lois et régulations que les lobbyistes du monde des affaires aimeraient voir supprimées ou allégées par le TTIP, on trouve les celles sur la sécurité alimentaire, le droit du travail, les garde-fous financiers, le contrôle des substances chimiques toxiques ou encore les interdictions européennes relatives aux organismes génétiquement modifiés. Si l’on y ajoute le désir des négociateurs d’octroyer des pouvoirs sans précédent aux entreprises multinationales en matière de poursuite des États souverains devant des tribunaux d’arbitrage privés, le décor est en place pour une attaque frontale contre la démocratie de part et d’autre de l’Atlantique. Grâce à cette prise de conscience croissante de la menace que représente le TTIP, des militants de toute la Grande-Bretagne regroupent à présent leurs forces au sein d’un vaste mouvement d’opposition à cet accord. À War on Want, nous sommes sollicités tous les jours pour fournir des intervenants et de la documentation à des groupes locaux de tout le pays, qui veulent en savoir plus sur le TTIP et ses dangers. La brochure sur le TTIP que nous avons produite avec la Fondation Rosa Luxemburg (désormais disponible en sept langues européennes dont le français) s’est trouvée si rapidement épuisée que nous avons déjà été obligés de la faire réimprimer. Malgré le peu d’intérêt affiché par les médias dominants, c’est une question qui monte rapidement à l’ordre du jour politique national. Ce mouvement regroupe des militants de tous horizons. Des groupes de plaidoyer anti-capitaliste comme War on Want, qui luttent depuis longtemps contre les dangers des accords de libre-échange, ont uni leurs forces avec le World Development Movement, les Amis de la terre et d’autres organisations de la société civile pour alerter l’opinion publique sur la menace que représente le TTIP. Des collectifs anti-gaz de schiste, des activistes du mouvement Occupy, des militants de la souveraineté alimentaire et des membres de l’Assemblée populaire contre l’austérité se sont tous joints à la résistance. Les mouvements locaux qui se battent pour défendre le précieux Service national de santé de la Grande Bretagne (National Health Service, NHS) sont particulièrement mobilisés, car ils voient dans le TTIP, à juste titre, un risque de privatisation irréversible de ce service. Le mouvement syndical britannique est également très mobilisé. UNISON, le syndicat du secteur public qui représente 1,3 million de travailleurs, est un des leaders de la campagne contre le TTIP, et a publié sa propre brochure détaillant les raisons de son opposition. Les syndicats d’enseignants contribuent eux aussi à la résistance – aussi bien l’Union nationale des enseignants (National Union of Teachers, NUT) que le Syndicat des universités et des facultés (University and College Union, UCU) lequel a adopté une motion condamnant le TTIP lors de sa conférence annuelle en mai dernier. Le Syndicat des services publics et commerciaux (Public and Commercial Services Union, PCS), qui représente les fonctionnaires, s’est lui aussi joint au mouvement. Ce ne sont pas uniquement les syndicats des travailleurs du secteur public qui ont pris publiquement position contre le TTIP. Le troisième plus grand syndicat du Royaume-Uni, le GMB, représente plus de 600 000 travailleurs, la plupart dans l’industrie. Le GMB a également rejoint la campagne contre le TTIP, et son secrétaire général a co-signé une lettre avec d’autres leaders syndicaux demandant la suspension du TTIP. Des appels parallèles à cesser les négociations sur le TTIP ont émané de fédérations syndicales dans des pays tels que l’Allemagne, la France et l’Espagne, représentant des millions de travailleurs européens au total. La menace du TTIP touche tous les secteurs de la société. C’est précisément pourquoi nous finirons par vaincre. Lorsque les pays de l’OCDE ont tenté de donner les mêmes pouvoirs aux entreprises multinationales à travers l’Accord multilatéral sur les investissements, un mouvement international a pris son essor pour combattre cet accord, et a obtenu son abandon. L’UE a ensuite essayé d’atteindre le même objectif en élargissant le mandat des négociations de l’Organisation mondiale du commerce (OMC) pour y inclure les investissements, les achats publics et les politiques de concurrence, dans le cadre du cycle de Doha de négociations commerciales internationales, lancé en 2001. À nouveau, ces thèmes ont été abandonnés, et l’OMC n’a jamais réussi à restaurer sa crédibilité perdue suite à cet échec humiliant. Notre victoire contre le TTIP sera le fruit d’une riposte concertée et unitaire. Cette riposte est en train de se construire en Grande-Bretagne, comme dans les autres pays européens et aux États-Unis. Avec la Fondation Rosa Luxemburg, UNISON, le World Development Movement et d’autres, War on Want organise des conférences à travers tout le pays dans le cadre de la campagne « No TTIP » du 8 au 10 juillet, qui culminera dans une première journée nationale d’action le 12 juillet. Suite au succès de nos interpellations des candidats aux élections européennes sur le TTIP, nous nous préparons à contacter tous les nouveaux députés européens du Royaume-Uni et à leur demander de se joindre au mouvement contre le TTIP. Nous préparons également les élections nationales de 2015 en Grande Bretagne ; nous espérons faire du TTIP un sujet clé pour tous les candidats qui rechercheraient nos votes. Nous avons beaucoup de travail à accomplir si nous voulons transformer cet accord de libre-échange Europe-États-Unis en une bataille politique clé. Mais le mouvement anti-TTIP, ici en Grande Bretagne, ne manque pas d’énergie ni d’engagement, et nous sommes prêts pour la bataille. John Hilary, Directeur exécutif de War on Want et auteur de la brochure Le Partenariat transatlantique de commerce et d’investissement. Une charte dérégulatrice, une offensive contre l’emploi, la fin de la démocratie (ici). Vous souvenez-vous de l’organisation d’un référendum sur la création d’un marché unique entre l’Union européenne (UE) et les États-Unis ? Mais si, vous savez, celui qui nous demandait si les entreprises multinationales devraient avoir le pouvoir d’invalider nos lois ? Non ? Moi non plus… Il faut dire que l’autre jour, j’ai cherché ma montre pendant dix minutes avant de me rendre compte qu’elle était à mon poignet. Oublier ce référendum trahit probablement mon avancée en âge… Car il a forcément eu lieu, n’est-ce pas ? Après tant de tergiversations sur l’opportunité de rester membre de l’Union européenne ou pas,  le gouvernement n’aurait jamais abandonné notre souveraineté à une entité obscure et non élue sans nous consulter ! Je me trompe ? Le traité transatlantique (ou Trade and Investment Transatlantic Partnership – TTIP – en anglais) vise à supprimer les différences de réglementations entre les États-Unis et les pays européens ; je l’ai déjà précisé il y a deux semaines. Mais je n’ai pas évoqué l’aspect le plus important de ce projet, à savoir le fait qu’il attribuerait un pouvoir exorbitant aux multinationales qui auraient ainsi le droit de traîner devant les tribunaux toute nation ayant l’audace de défendre ses citoyens. Ce traité permettrait à un panel secret d’avocats d’affaires de faire fi de la volonté de notre Parlement et de démanteler notre protection sociale. Pourtant, on n’entend guère protester les ardents défenseurs de notre souveraineté. Ce mécanisme porte un nom : le règlement des différends entre investisseurs et États (RDIE). Il est déjà activé un peu partout dans le monde pour rayer de la carte les législations destinées à protéger les personnes et la biodiversité. Au Salvador, des communautés villageoises ont réussi à convaincre – au prix d’un lourd tribut : l’assassinat de trois paysans – le gouvernement de suspendre un projet de mine d’or qui menaçait de contaminer leurs ressources hydriques. Est-ce une victoire pour la démocratie ? Peut-être pas pour longtemps. La société minière canadienne positionnée sur ce projet réclame en effet 315 millions de dollars de réparations au pays pour la perte de ses futurs profits espérés. Au Canada, les tribunaux ont invalidé deux brevets détenus par le groupe pharmaceutique américain Eli Lilly, celui-ci n’ayant pas fourni suffisamment de preuves de leurs effets bénéfiques. Inadmissible pour cette entreprise qui a intenté une action en justice contre le gouvernement canadien dans le but d’obtenir 500 millions de dollars de dédommagements et le changement du système de brevets. Ces sociétés, comme des centaines d’autres, jouent habilement des règles d’arbitrage des différends entre investisseurs et États, lesquelles sont inscrites dans des traités commerciaux signés par les pays qu’elles attaquent. Les instances chargées de faire appliquer ces dispositions ne présentent aucune des garanties que nous considérons comme essentielles dans nos tribunaux  et leurs audiences se tiennent à huis clos. Les juges qui les composent sont des avocats d’affaires dont beaucoup travaillent au service de puissantes sociétés semblables aux entreprises plaignantes. Les citoyens et les communautés directement concernés par leurs décisions n’ont pas la capacité juridique de s’y opposer et il est impossible de faire appel des jugements de ces tribunaux. Pourtant, ce petit groupe de juristes a le pouvoir d’abolir la souveraineté des parlements et de contester la volonté des cours suprêmes. Vous n’y croyez pas ? Voici ce qu’a déclaré l’un de ces juges en question : « Quand j’y songe, j’ai toujours du mal à comprendre que des États souverains aient pu souscrire au principe même d’arbitrage des investissements… Trois individus peuvent remettre en cause, sans restriction ni possibilité de recours, toutes les actions du gouvernement, les décisions des tribunaux et les lois et réglementations émanant du parlement. »  Il n’existe pourtant pas de droits équivalents pour les citoyens. Nous ne sommes pas habilités à saisir ces tribunaux pour réclamer une meilleure protection contre la rapacité des entreprises. Comme l’indique le Democracy Centre, il s’agit d’un « système de justice privatisée au service des multinationales ». Ces procès n’ont même pas besoin d’aboutir pour avoir un impact fortement dissuasif sur les législations. « Au cours des cinq dernières années, les cabinets juridiques de New-York et de Washington ont fait pression sur le gouvernement canadien à chaque nouvelle disposition ou proposition dans le domaine environnemental. Produits chimiques de nettoyage, produits pharmaceutiques, pesticides, Droit des brevets : tout y est passé. L’intégralité des propositions a fait l’objet d’attaques ciblées et la plupart d’entre elles n’ont jamais vu le jour » a ainsi déclaré un haut responsable canadien du gouvernement évoquant les règles découlant de l’Accord de libre-échange nord-américain (Alena). Dans de telles conditions, la démocratie – au sens plein du terme – n’est qu’une illusion. C’est le système auquel nous serons soumis si le traité transatlantique devait entrer en vigueur. Les États-Unis et la Commission européenne, qui sont devenus les serviteurs des entreprises qu’ils étaient censés encadrer, demandent instamment que soit inclus dans l’accord le mécanisme de règlement des différends. Pour justifier sa position, la Commission soutient que les tribunaux nationaux offrent une protection insuffisante aux entreprises dans la mesure où ils « peuvent faire preuve de partialité ou manquer d’indépendance ». De quels tribunaux parle-t-elle ? Ceux des États-Unis ? Des pays membres de l’UE ? Mystère. En réalité, pas un seul exemple concret démontrant la nécessité d’un nouveau système extrajudiciaire n’a jamais été cité. C’est justement parce que nos tribunaux sont la plupart du temps impartiaux et indépendants que les grandes entreprises cherchent à les court-circuiter. La Commission européenne entend donc remplacer des instances transparentes, souveraines et comptables de leurs actes par un système opaque et corrompu gangrené par les conflits d’intérêts et gouverné par l’arbitraire. Le règlement des différends entre investisseurs et États pourrait être utilisé pour faire échec à toute velléité de protection du NHS (National Health Service) face aux appétits du privé, de régulation des banques, de lutte contre la cupidité des entreprises énergétiques, de renationalisation des chemins de fer ou encore d’opposition à l’extraction des combustibles fossiles. Ces règles empêchent les alternatives démocratiques et rendent impossible la mise en œuvre de politiques de gauche. Voilà pourquoi notre gouvernement s’est bien gardé de mentionner cette monstrueuse offensive contre la démocratie, et a fortiori de nous demander notre avis. Cela n’a rien d’un hasard non plus si les conservateurs, d’ordinaire si prompts à brandir l’étendard de la souveraineté, ne disent mot. Réveillons nous, nous sommes en train de nous faire avoir !